Straight Conversations about Conscious Business, Social Media, Mind-Body-Spirit, Law of Attraction and more with brilliant authors, speakers, business owners, leaders from around the world. 5-1-14 Today on Straight talk with Carly Alyssa Thorne we have Guest Corey Jahnke and talk about Leadership Customer Service. 2-26-14 Today on Straight talk with Carly Alyssa Thorne we have Mary C Kelly, today we talk about some of the challenges veterans face when they transition back into the civilian workforce and the ways to make it easier. 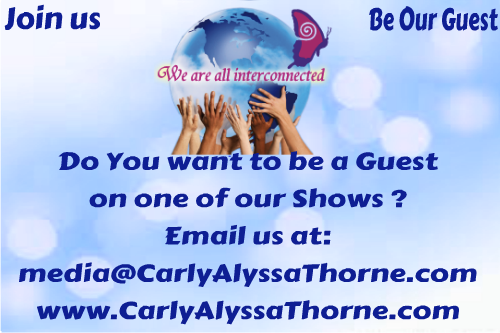 2-6-14 Today on Straight talk with Carly Alyssa Thorne, Guest Katherine Metcalf and Carly discuss Conscious Communities. We do not tell our guests what to say, they are expressing their own personal opinions. We do not discriminate against any one Religion, Faith, or ethnicity and are of the belief we are all interconnected. Any advice or subjects we discuss are of our own Personal experiences. Please seek proper counsel from Your own personal advisors whether it be Your Doctor for medical and or health issues, an Accountant for Financial Advice or any Professional you deem necessary. Carly Alyssa Thorne is not a licensed attorney, accountant, Doctor, or Psychologist. Before making any decisions using information contained in our Video’s, Podcasts, websites, teleconferences or any other form of communication you should receive, seek advice from your licensed professional. All information is subject to verification, errors and omissions.